Most Americans eat turkey once a year, around Thanksgiving. In fact, according to the National Turkey Federation, 88 percent of Americans eat turkey that day, consuming about 46 million turkeys. But what is it about the humble turkey that makes us want to cook it in crazy ways? We deep-fry it whole, we stuff it with other birds for turducken, and, sometimes, we bathe it in mayonnaise. Note to adventurous cooks: Please read the directions carefully. Think about how you will pull 20 pounds of dead weight out of a pot of boiling oil before you drop the turkey. 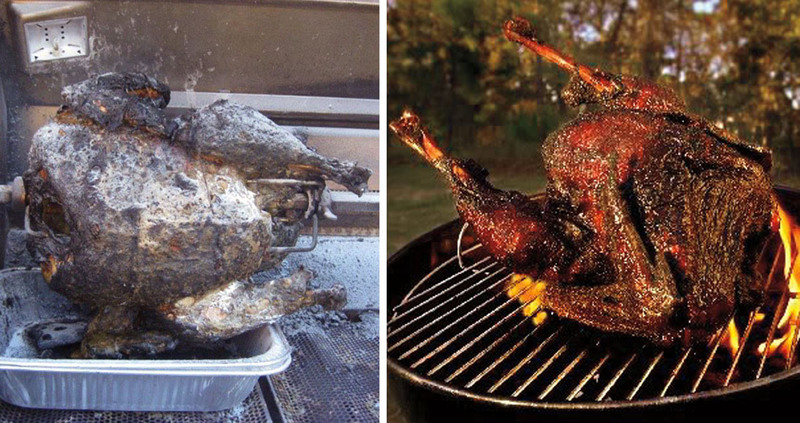 And never, ever put a mayonnaise-coated turkey on a gas grill. The turkey carcass here is proof of that. So was the charred house next to the grill. Remove giblets from the body cavity of the turkey and rinse the turkey cavity with cold water. Pat dry with paper towels. Mix the mayonnaise and kosher salt together thoroughly and generously hand-rub the mixture over the outside and inside of the turkey. Place the turkey breast-side-up on a rack in the roasting pan. Combine the onion, carrots, celery and herbs and stuff loosely in the neck and body cavities of the turkey. Place half of the apple at each cavity opening to secure the herbs and vegetables while cooking. Tent the turkey with aluminum foil. Roast for approximately two hours. Remove the foil and baste the turkey with the drippings. Continue roasting for approximately one more hour until the meat thermometer reaches 170 when inserted into the breast. Remove the turkey from the oven and let rest for 15 minutes. Discard the vegetables and herbs, and place the turkey on a cutting tray. Drain the juices and use for your favorite gravy or as an au jus. Slice the turkey when ready to serve. Recipes reprinted with permission of the owners.